We’ve looked at the defensive role that fixed income plays within your investment portfolio. Now it’s time for a closer look at the asset class and the relativities between the different securities available. Australian Government bonds are among the safest investments available to investors on the risk / reward spectrum. They are available to buy and sell on ASX as CDIs (Chess Depository Interests) which is conceptually similar to XTBs. They tend to have lower yields than Term Deposits, so they have not been very popular with individual investors to date. But, they do have the same defensive features as the other fixed income options above them on the risk/return spectrum – TDs and Corporate Bonds. Term Deposits, or TDs are not tradable like shares, ETFs and XTBs, but they are fixed income investments. Like corporate bonds and XTBs, TDs have a fixed life and they provide regular income payments during that life, or alternatively at expiry. TDs may enjoy the benefit of protection under the Financial Claims Scheme. Rates for TDs have been falling throughout 2014, 2015 and into 2016. TD rates are generally higher than Government bond yields but lower than equivalent corporate bond yields. This is because the risk of lending money to the government is lower than the risk of lending it to a bank. In turn, this risk of lending to a bank is lower than the risk of lending to a company. So, in theory yields are progressively higher when you move from government bonds, to TDs, to corporate bonds, which is in keeping with the chart above that shows the more risk you take on, the greater the reward should be and vice versa. TDs cannot be traded, so if you want your money back early, you have to “break” it. When doing this there is a strong risk you might lose a significant portion or all of your return (the interest), along with potentially part of the principal, depending on the break fee incurred. Since 2015, changes by global regulators have resulted in new rules meaning TDs can only be broken with 31 days’ notice to the bank, which means you can’t access your cash for 31 days. The inability to sell your TD on a market like ASX is an unavoidable feature that comes with any bank account. A key benefit of all types of securities traded on ASX is the ability to sell at a prevailing price and access your cash 2 days after you sell. Before XTBs on ASX, dealing in corporate bonds was mostly the domain of institutional and sophisticated (“wealthy”) investors who traded them ‘over-the-counter’ (OTC) in the wholesale market. This usually involves buying bonds in large parcels – sometimes from $50,000, but more commonly in $500,000 parcels. There is little or no transparency on this sort of trading, as wholesale markets don’t have a central transparent market like ASX. Therefore, there is no clear price you can either buy or sell bonds at. Each broker or bank quotes their own prices on a transaction-by-transaction basis, and fees or commissions are usually hidden in prices you pay. You should not believe it if you’re told you don’t pay brokerage or fees for trading. It’s been built into the price you pay relative to the price the bonds were bought for in the wholesale market. There is a wider range of bonds in the wholesale market than is available on ASX both in government bonds via CDIs and corporate bonds via XTBs. But the range of ASX traded bond units is growing as new XTBs are issued and ASX brings out new CDIs over new government bond series. ETFs and managed funds that cover bond markets and indices are available to investors. Both ETFs and managed funds give investors diversified exposure to bonds and other asset classes. XTBs have some similarities in structure to ETFs and managed funds, as they are all unit trusts. XTBs mature when the bond matures. ETFs and funds do not mature – they are perpetual investments. This makes them fundamentally different to XTBs. The income and capital XTBs deliver is predictable – the coupons and principal from specific bonds are known amounts. ETFs and managed funds deliver income and capital from diversified and perpetual portfolios. This can change all the time, and a perpetual fund never matures, so it isn’t possible to predict the future income and capital from your perspective. These two distinctions make a very big difference. When you buy XTBs, you know precisely the outcome you will get on the day you buy them in terms of income and capital (assuming the bond issuer does not default). If you invest in 2016 in an XTB maturing in 2020, you will know on the day you invest what income and capital you will receive in 2016, 2017, 2018, 2019 and 2020, subject only to a default by the bond issuer. Therefore, you can accurately predict and plan the cash flows from your investment. This is a key advantage for investors looking for outcome-based solutions to match against known outgoings like school fees or retirement costs. You cannot do this with any diversified fund or ETF as the portfolio changes all the time and there is no principal repayment as they never mature. Diversification is important, but when you diversify and the investment is perpetual via a fund or ETF, it does have this unavoidable drawback. Most ETFs and some Managed Funds track, or are benchmarked against broad bond market indices. These indices are dominated by government bonds. The Bloomberg Ausbond Composite Index contains about 88% government bonds. It is Australia’s most well-known bond market index. The low yields on government bonds drag down the returns available on any fund benchmarked against, or tracking this and other broad market indices. Investment in senior corporate bond returns via XTBs can provide considerably better returns. It does this by giving you access to higher yielding corporate bonds. Corporate bonds are higher risk than government bonds. This is because the government is a better credit proposition than a top 50 ASX corporate. 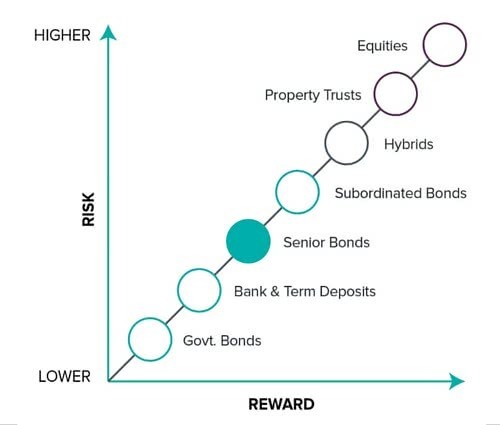 If you’re looking for higher yields and are willing to take the risk of corporates defaulting (ie, you don’t think it’s likely BHP, Telstra, or Woolworths etc., will get into financial difficulty and not be able to pay their bills), then XTBs can deliver better returns than ETFs and managed funds built around major bond indices. There are managed funds focused solely on corporate bonds that do not have government bond exposure. However take care to look out for the manager’s fees. Some funds quote returns before fees, which can be misleading. Bond indices may not represent an index of the ‘best’ companies per se. You would expect the S&P ASX 200 equity index to be composed of the biggest 200 companies on ASX by size and liquidity. But, the bond index is simply those with the most debt, which is not a measure of quality or strength. Hybrids are not part of the world of fixed income because they have too many equity features to be defensive. However, we include them here as many investors have previously held them as part of their fixed income portfolio. This view is changing with a large part of the professional advice community reclassifying them as growth assets. Like XTBs, hybrids are usually ASX traded. As there is a wide range available, general comparison is difficult. However, all hybrids have some common features. They are neither true fixed income, nor pure equities but as the name suggests a combination of both. Some hybrids issued in the past were more debt-like than equity-like, and many investors held these ‘old-style hybrids’ as the best proxy available on ASX for fixed income. Global regulatory changes have banned these old-style hybrids and all new-style hybrids are far more equity-like – hence the general trend towards reclassifying them away from fixed income. A key reason they’re not a suitable replacement for fixed income or TDs is that their behaviour can change significantly over their lifetime. They can behave more like equities, or more like bonds depending on market conditions. When conditions are stable and strong, their fixed income features are more apparent – they will pay defined income and have lower market volatility (the degree to which prices fluctuate) and a lower correlation to equities. When market conditions deteriorate, they can rapidly become more equity-like with increased volatility – and at worst they may even convert into equity on terms that are not beneficial to the investor. But even before conversion is a real threat, they tend to track equities down when there’s a significant equity downturn. Hybrid investors can ride out the volatility and wait for the call date. However, the call date may be five years away and it may be deferred by the bank or APRA. If you need your money back before that, you might have to sell at a lower price. APRA has taken steps to ensure banks don’t sell hybrids as “maturing” instruments. Call dates are optional and APRA approves each call being made. It can tell the bank to defer the call date depending on the health of the financial sector, or the particular bank. Fixed income investing is about lending money and getting that money paid back on a known date with income along the way. Hybrids are a buffer to protect banks in a crisis. They’re increasingly more equity-like since APRA banned the more debt like ones. Hybrids should not be considered as a replacement for a conservative TDs strategy. They may have an attractive income, but a 6% income yield could be offset by a 6% or more capital loss, if you need to sell prior to the call date, or the hybrid is not called. A key recommendation for any investment portfolio is to diversify. This means that you should hold a variety of investments across the different asset classes. It will leave you less exposed to events that hit a particular asset class, such as an equity, bond, or property market crash. However, it is also essential to have the right securities in the appropriate area of your portfolio. Assets that carry higher risk should deliver higher returns, but are also likely to have far more volatile returns. They may fit well in the growth area of your portfolio. For the defensive part, the important question is – what investments provide capital-stable returns with reasonable income? Fixed income investments like Government bonds, TDs, corporate bonds and XTBs over them will provide that defensive investment profile.